Earlier this year, I began not one, but two, daily challenges – blogging and photography. Yesterday I wrote about why I started blogging and continued blogging. As I worked on my post, I realized that while I blogged because I enjoyed it, I had begun the daily photo challenge for a totally different reason. I started it to improve my camera skills, especially to learn how to use the new Canon Rebel that my favorite boy toy talked me into buying. Until I bought the Rebel, I always used point and shoot cameras. I took many good photos with them even recently, as I don’t always take my Rebel to work with me. I do take better pictures with the Rebel and it is much easier to take good pictures too. The first few weeks of the photo challenge were fun – oh, click this! click that! this! that! And then I decided I’d never improve my technique if I didn’t work at it harder. So I learned how to change the focal point and the metering. I learned about depth of field. I did it on both cameras too. It was funny during lunch trying to remember which button the camera used as they were not quite identical, mostly due to the age difference (about 7 years). My reason for a daily photo challenge did change this summer to building up a portfolio of photos, which was a wonderful benefit. I’m loving all the pictures of the dogs, my favorite boy toy, my daughter, the clouds and the flowers. It’s certainly helped my blog. I’m okay with changing my reason for doing it. What was good was to begin it and let it evolve just as my blog did. At the right side, I have some links to reasons for doing a photo challenge. I found them inspirational and helpful. I also listed some places to go for help on photo editing. I don’t spend a lot of time doing Photoshop, but it can help a good picture become better or repair a photo that is a one-of-a-kind. There are also links to others who are doing a daily photo challenge [note – these links are no longer there, but a lot of material can be found on the Internet]. As you set goals for next year, consider whether a daily challenge of any kind would help you learn a skill. It doesn’t have to be for a full year. If you want to expand your cooking skills, maybe you need a daily challenge for 30 days or 3 months. If your goal is to scan old family photos, you might want to challenge yourself to scan something daily. Challenges are both fun and frustrating. It’s easy to get discouraged for a while until you realize that wow, I did that. I DID THAT. It makes it all worthwhile to keep going in the challenge. It’s nearly the end of the week. Do you believe it? Christmas is coming quickly. Today I start opening the little windows on my Advent calendar. I waited too long to buy it this year and don’t have a nativity one, but it will still be fun to get glitter everywhere each morning even without a cat nose to investigate it (the dogs are not allowed upstairs). I took today’s photo in mid-October at the botanical gardens. 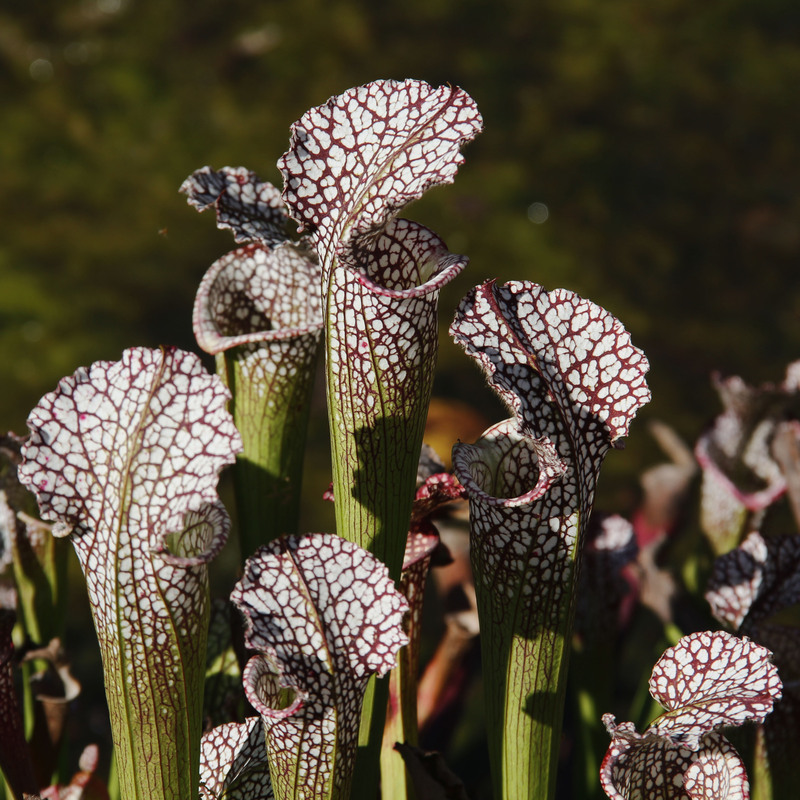 I was amazed at how lush the pitcher plants were as during the heat of summer they looked terrible. I didn’t realize they grew all year until I saw them in October. Word for tomorrow – CHAMPION. If you prefer to work ahead, see the list for the week under “A Word A Day”. Interesting and motivating post. Well done. Encouraging post, Nancy. I like your pitcher plant, quite interesting. Thanks for the feedback and the award! My post on Friday will pass it along. After reading this I have decided to put an end to the flip flopping about it, I am inspired and will take on the 365 challenge. I also just acquired a new dslr and have been slightly intimidated by it. So I thank you for this post. Best of luck to your endeavor. I’m glad you’re encouraged to try a photo challenge. After looking at your blog, this might help provide more material for you to work with, although you are pretty prolific even without a challenge! Still, if the camera has you intimidated, a daily challenge even for 30 days is a great way to break it in. I walk around downtown during lunch every day, so I have often have the same subject matter day after day. I’ve still managed to find things to photograph that are different. If something didn’t work, I can try again the next day or so and see if I can improve it (which I did a fair amount of). Thanks for stopping by and subscribing.